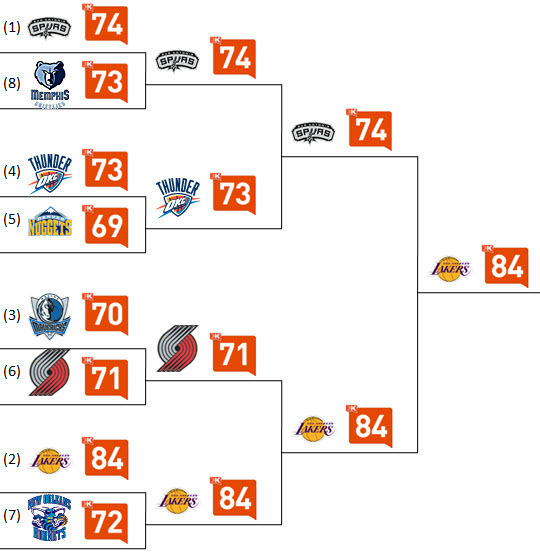 This year’s NBA playoffs have been great so far, a nice surprise considering it is still early in the second round. 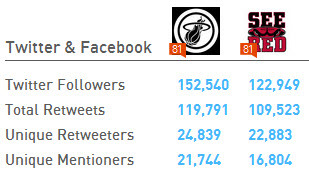 Since I like looking at the social media presence of NBA teams I thought I’d run the 2011 playoff teams through the beta version of the new Klout to see how the fare against each other. Last year I simply ranked the NBA playoff teams by Facebook engagement, so this year I thought I’d try a different approach for Twitter and apply Klout scores to the actual bracket and declare a winner for each matchup, round by round. 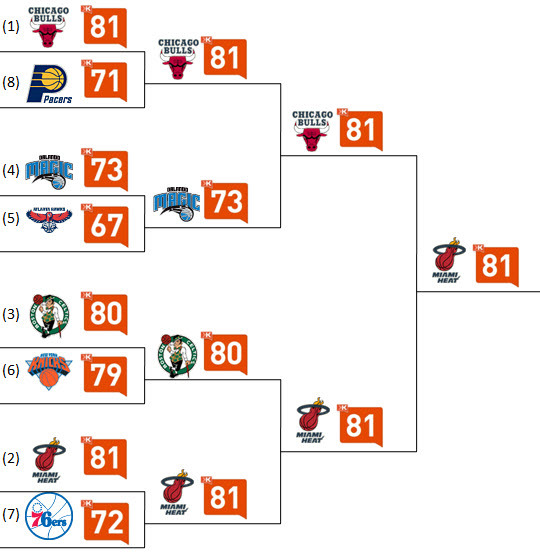 Chicago and Miami cruised through the first round, similar to how it happened in the actual playoffs. Atlanta had the worst Klout score in the conference so that doesn’t sync with their surprising performance thus far in the playoffs. Their 67 is more symbolic of how they laid an egg in last year’s playoffs. Boston had a much tougher matchup against the Knicks on Klout than they did on the court. In the second round the Magic proved no match for the Bulls. Boston and Miami was a great matchup; let’s hope the real series is that close. Memphis matched up well against the Spurs but unfortunately for them when it comes to Klout they fell just short. The Thunder beat the Nuggets in a fairly close series and Portland managed to sneak past Dallas. The Lakers had no trouble with New Orleans. In the second round the Spurs made it through another matchup 74-73, close to how many fans thought the veteran team might perform in the actual playoffs. The Lakers blew past the Blazers, so no revenge for their loss with Scottie Pippen to the Shaq/Kobe Lakers. Los Angeles easily defeated the Spurs in the conference finals. Will they make it happen on the court? Not even close! 🙂 But the point was to compare the teams head-to-head by Klout score, not to try to use Klout to predict the actual champion. So it’s really a better indicator of popularity from past success plus current level of engagement. funny how you underestimated the mavs..
gc, we’ll see if the Mavs’ success in this year’s playoffs thus far will translate into an increase in popularity and activity around their Twitter account. Their current Klout score of 70 is comparable to several other teams but still fairly low.